A water efficient landscape incorporates the use of drought tolerant plants with principles of irrigation scheduling to meet each landscape’s specific requirements. 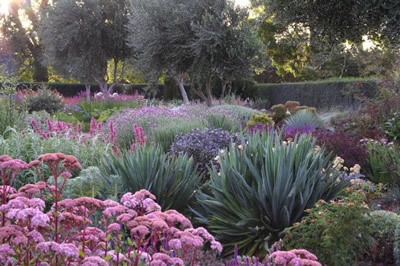 Drought tolerant plants require very little water, or no water, once they are established. Water efficient landscaping lowers consumption of groundwater; allows more water to be available for other domestic and community uses and the environment; requires less time and work for maintenance; and when water restrictions are implemented, drought tolerant plants will tend to survive and thrive, while more thirsty ornamental plants may be unable to adapt. This is a great practice for any garden or landscape in California, regardless of soil conditions and topography. The California Native Plant Society’s Calscape tool can help you choose native plants suitable for your landscape. Calscape allows you to search native plants by location and filter according to plant type, water needs, shade tolerance, and other criteria, and will help you find a local nursery.